Here are my succinct notes about using Mesosphere DC/OS (Data Center Operating System) and Marathon within its “SMACK stack” to create a Software Defined Data Centers: Composable Infrastructure – managing bare metal resources just like the cloud. Initially written as a research project at Berkeley, the Mesos Apache project runs both containerized and non-containerized workloads in a distributed manner. Mesos was adopted by Twitter as an answer to Google’s Borg (Kubernetes’ predecessor). Mesosphere as an organization aims to make container orchestration less complex to use by regular human beings by supplying the Marathon “plugin” to Mesos to handle container scheduling. 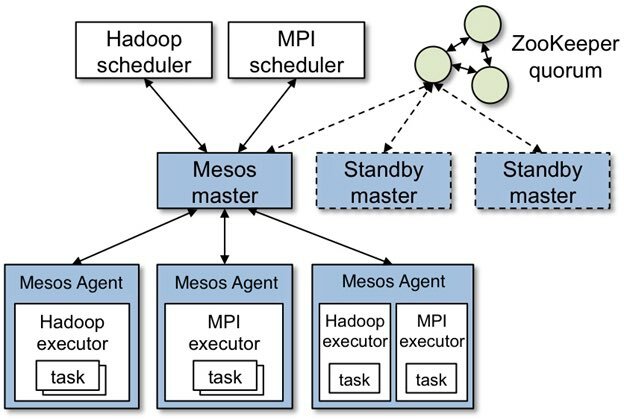 Now Mesos became synonomous with DC/OS when, in mid-2016, Mesosphere introduced DC/OS (Distributed Cloud Operating System, aka Data Center Operating System) to simplify Mesos to the point where a Mesos cluster can be deployed with the Marathon scheduler in a few minutes. UCR (Universal Container Runtime) enables containers without Docker by running containers without an image (zip, tar, JAR), from appc image, or OCI image as well as Docker image file. It can nest containers as builds under Jenkins. [Mesosphere DC/OS reduces AWS bills by dynamically automating where services run on hardware across the datacenter. Higher utilization is achieved by DC/OS pooling unused capacity and moving apps to them. It goes beyond what VMware does, load balancing across several clouds and on-premises as a single set of resources to allocate as needed. That enables the handling of a massive amount of data and processing. Mesos handles storage volumes as well as CPU, memory, and network resources. The ability to scale up and out impacts availability. K8S nodes are anologous to Mesos’ agents. But Mesos adds a scheduler layer that doesn’t exist in K8S. Although Hadoop (big data) and MPI (messaging) schedulers are shown above, dozens of schedulers are available, including the Marathon container scheduler and Jenkins. You can create your own scheduler. Akka supports multiple programming models for concurrency, but it emphasizes actor-based concurrency, with inspiration from Erlang. It’s from Lightbend. As its name suggests, DC/OS is more than a container orchestration framework like Kubernetes. In fact, Kubernetes can run on top of DC/OS and schedule containers with it instead of using Marathon. But DC/OS is “less opinionated”. It can run non-containerized, stateful workloads. Marathon’s APIs are more straightforward in comparison to Kubernetes. Marathon aggregates APIs and provides a relatively small amount of API resources, while Kubernetes provides a larger variety of resources and is based on label selectors. Kubernetes has almost 10x the commits and GitHub stars as Marathon. Many of the people are associated with both accounts. https://github.com/alejandroEsc/kraken Deploy a Kubernetes cluster using Terraform and Ansible on top of CoreOS. Installation on AWS & GCP is manual. One of the selling points of Mesos is that monitoring configuration is included. Generate flame graphs of CPU times with functions called. A Mesos Master which knows about available computing resources makes offers to a Scheduler. The Scheduler accepts or declines offers. Accepted offers are sent to applicable Resources to launch executors/tasks. MesosCon 2018 is held in New York City on November 5th-7th, 2018. 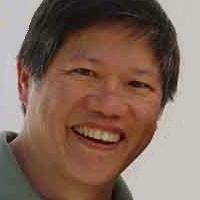 VIDEOS: MesosCon North America Los Angeles Sep 26, 2017 is keynoted by Ben Hindman, Co-Creator, Apache Mesos and Founder, Mesosphere First held in 2014. There is also a MesosCon Europe and Asia. SMACK Mesos stack (based on Mesosphere/Marathon DC/OS) was published on October 14, 2018 .